Nestled among the pines on a breathtaking island, the Island Lodge at Salmon Lake provides access to five picturesque miles of water at the southernmost tip of the Seeley Swan Valley. It’s a private retreat where you can experience a whole host of summertime activities, including fishing*, a floating trampoline, jet skiing, kayaking, paddleboarding, paddleboats, sailing, swimming, sunset pontoon boat tours, wakeboarding and waterskiing. Helping you get your feet wet, the Lodge comes staffed with activity guides, a talented chef and an island butler. Naturally, fine cuisine is prepared on-site and includes a beverage service with beer, wine and signature cocktails like our gently spiked blackberry lemonade. Evenings sparkle with bonfires and live music. 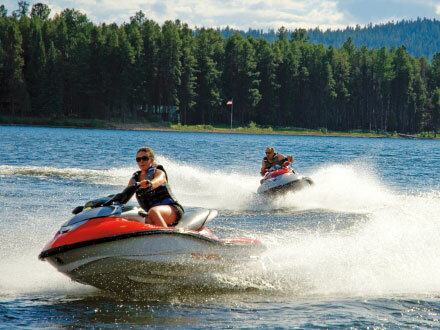 Just a 15-minute drive from The Resort at Paws Up, the Island Lodge at Salmon Lake will have you bobbing up and down for joy. Full-day plus three-hour morning, afternoon and evening excursions are available. *Catch-and-release fishing is available on Salmon Lake. Spinner rods are provided, along with two boats with trolling motors. 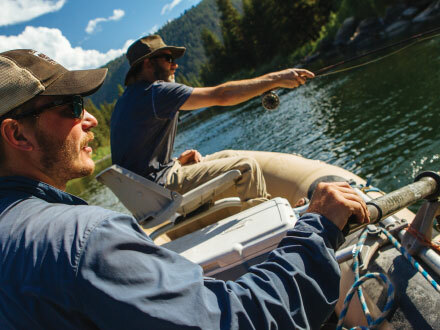 Fishers can look forward to landing trout (brook, brown, bull and cutthroat), largemouth bass, mountain whitefish, kokanee salmon, yellow perch and northern pike.